Outline: Dialogue between father and son. Fears discussed. Two kinds of fear---of God and of Satan. Fear of Satan and related fears blind people to the truth. Proper fear of God brings light. We should fear to turn from God and walk the path of Satan. The way to leave Satan's path is to call upon Jesus and be freed from Satan's power. Following Jesus brings joy and assurance of heaven. Written for Africa originally. 1. Father, do you hear the hyenas? Is it true that hyenas, and birds on the roof, and things like that, bring us something evil? (Use local superstitions). 2. Ah, no, my son. The hyenas are just hungry, and the birds are only sitting. Listen, my son: there are only two fears in this world. One kind is from God, and one is from Satan. We Nuers (name of local tribe) are full of the fear of Satan. We are afraid of death. 1. Yes, we are afraid of death. 2. Look. If a child is sick we kill a cow because we are afraid. (Use local practice). We are afraid of many other things because we are afraid of death. This fear has bound us. This fear has made us like blind people. We walk in darkness. This custom has come from the lies of the father of evil. 1 But, Father, aren't you afraid of death? 2. Ah, son, death on this earth is not the thing to fear. What comes after death is more to be feared. Our ways are directing us to the father of evil. He is the enemy of the true God. If we follow the father of evil we will arrive at his place. His place is the place of fire which the true God has made for him. It is this place that we must be afraid of. The true God is stronger than the father of evil. We must be truly afraid if we are not following God's words. God hates the ways of Satan. No person can carry the words of God and the words of Satan together in his heart. These words cannot be united. 1. But, Father, why did you leave the way of Satan? Weren't you afraid? 2. The true God showed me the truth. His truth is like noonday, so that a person can walk there without fear. When we follow the words of Satan, we are filled with the fear of Satan. But God is stronger than Satan. If we follow the words of God we will have no fear of Satan or of any evil spirits. 1. You said the fear of what comes after death is the greatest fear of all.) But you don't seem to be afraid! 2. I am afraid of only one thing. That is to leave the way of God. The people who truly walk with the words of God are on God's path. They will arrive at God's village when they die. Some people say they have the words of God, but they have not left the way of Satan. If their living is not the same as the talk of God, you will know they are on the path of Satan. But God sees the heart of everyone. He knows who is on His path. Everyone who is not truly on God's path is going in the direction of the place of Satan. 1. But how can we know if we are truly on God's path? 2. I will tell you. Satan has conquered and tied all people. They cannot leave his path. But God found one plan to free the people from the path of Satan. He sent His Son, Jesus, to this earth. Jesus was altogether good. He never did one sin, but He paid for our sins by dying in our place. He died and rose again. He overcame Satan and death. 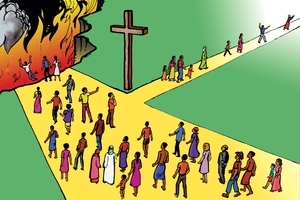 Now every person who wants to leave the path of Satan may call to Jesus, God's Son. He will free them and put His Spirit in them. At that moment they will begin going in God's direction on God's path. His Spirit will give them power so that their lives will be the same as God's talk. Those who have God's Spirit are truly God's people. They will not be afraid of what comes after death because they are going to God's good place. I know the true God now, and I am not afraid, even of death. God has conquered death. 1. But doesn't Satan try to get you back to his path again? 2. Yes, but God's Word is like light to my feet, on God's path. His Spirit makes me strong to refuse the talk of Satan. Jesus is with me everywhere. He is my close friend. I would rather be hungry and cold, I would rather be poor and alone - - I would rather die than to leave Him. Because even if I die, I will go right to live forever with Him. Even now He fills my heart with great peace and happiness. And when I go to heaven it will be very much better. 1. Father, you sound very happy about this place! 2. Indeed I am, my boy! There is no sin, no sickness, no crying there. It is always bright and everyone is happy. And best of all, God is there, and Jesus, Who loved me so much that He died for me. Though Satan may try to get me to leave Jesus' path, I do not want to ever turn away from my best friend. GRN has recorded a version of this script in 27 languages and dialects. See full list.